Brand new Casino Wink Slots is offering 30 no deposit free spins on three different slots - Irish Luck, Asteroids and White Wizard Deluxe! As seen on TV! Find here how to join WinkSlots in less than two minutes and claim 30 no deposit free spins! 2. Open a new account with Wink Slots via this special link. It only takes two minutes! 4. Enjoy your no deposit free spins! 5. There are also further promotions for first deposits after that - Play the Wink Free Spins Wheel and win up to 500 free spins! New players only. Register, get 30 Free Spins [FS]: 10 FS*3 on selected slots. FS valid for 7 days, FS wins granted as bonus & set at min £1- max £4 (per 10 FS). Reg bonus wins are capped at £100, exc. jp win. 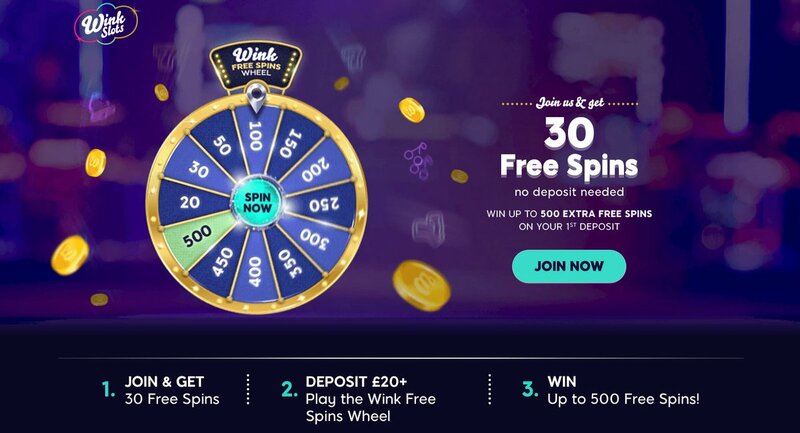 1st deposit min £20, gets 1 "Wink Free Spins Wheel" spin valid for 7 days. Win up to 500 FS on Kingdom of Cash, valid for 7 days & capped at min £4- max £100 (depending on FS amount). Odds of winning each bonus vary. Bonus wins are capped at £400, exc. jp win. To withdraw games bonus & related wins, wager 30x the bonus funds. Wagering reqs vary by game. Withdrawal restrictions and T&C apply. The fun never ends at Wink Slots Casino! Wink Slots, who has been created by the 888 group and is parented by TV advertised ‘Wink Bingo’, is accessible on all PC’s, tablets and mobile devices. The site has quickly obtained its UK Gambling license and provide the same professional and security level as 888, one of the industry's leading brand. Just register a new account to get max 30 Free Spins: 10 FS to each of 3 selected games. FS winnings are game bonus, granted after all FS are used, capped at min £1 - max £4 per each voucher of 10 FS. In order to withdraw games bonus and any related winnings, you must wager 30 times the amount of the games bonus funds. Withdrawal restrictions and full T&Cs apply. You may only participate in the Promotion, if you have registered with the Website and have yet to deposit any real money in your account with the Website prior to the Promotion Period beginning. Under the terms of this Promotion, players who successfully make a first minimum deposit of £20 in one go earn one spin the ‘Wink Free Spins Wheel’. Players must CLAIM the bonus via the automatic popup that will appear after a successful first deposit has been made. The free spins granted under this Promotion can only be used on the Kingdom of Cash slot game. The spin on the ‘Wink Free Spins Wheel’ game will be credited into your account after making the required deposit as explained above, and is available for use for 7 days. Spins that remain unclaimed will be forfeited after said 7 days. "Wink Slots 30 Free Spins - No Deposit Needed!"